IBM DB2 9 for Linux, UNIX, and Windows marks a new stage in the evolution of data servers. IBM has continually led the data management industry with the release of innovative technology. DB2 9 is a new generation data server with revolutionary pureXML technology. This technology in DB2 9 fundamentally transforms the way XML information is managed for maximum return while seamlessly integrating XML with relational data. 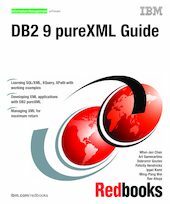 In this IBM Redbooks publication we discuss the pureXML data store, hybrid database design, and administration. We describe XML schemas, industry standards, and how to manage schemas. We also cover SQL/XML, XQuery, and XPath using easy-to-understand examples. Lastly, we show how to use XML technology efficiently in business applications.